This online game of Who Wants To Be A Millionaire is exactly what I would want from a online flash version of the TV quiz show with real money prizes. 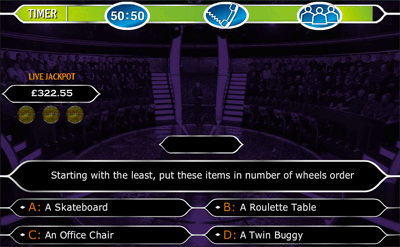 The Who Wants To Be A Millionaire quiz format has been transformed brilliantly in to an online game. In spite of the great job the creators have done, the game does have what some might consider to be flaws. 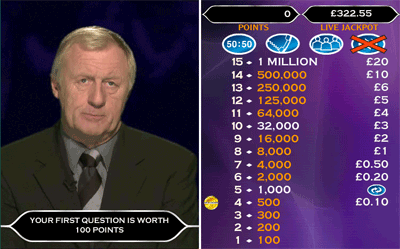 The worst offenders are the slow gameplay and Chris Tarrant. However, these are inherent to the game format and really should come as no surprise. Millionaire fun rating - 79%. The Who Wants To Be A Millionaire online quiz game for real money is slow moving. I’m sure that the game has been designed to play this way, but I know that it’s not going to be everyone’s cup of tea. Compared to other quiz games (like Bullseye) it takes a lot longer to actually getting around to winning money. Some may prefer the slower flow of the game and enjoy the leisurely pace. However, if you’re after fast questions and quick wins you are going to find this game a little tedious. In addition to all of this, you have Chris Tarrant to contend with. In between the insincere remarks about how unfortunate you are, you sometimes get a "Is that your final answer?". These are especially good fun seeing as you’re not actually allowed to change your answer. Nothing quite like rhetorical questions like that when you genuinely would like to change your answer. All in all, although I’ve mostly bitched and moaned about the pace of the game and Chris Tarrant, it really is a great adaptation of Who Wants To Be A Millionaire , and I don’t believe that they could have done better job. 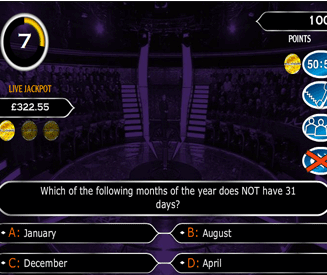 The basics of Who Wants To Be A Millionaire online. Play the fastest finger first round to get some lifelines under your belt. Try and answer 15 questions to win the top prize. Your winnings increase from one question to the next above a certain point. Use your lifelines to help you along. The biggest difference between the TV show format and the online game is that the fastest finger round is used to determine how many lifelines you have with you in the game. Other than that, it’s mostly business as usual. Who Wants To Be A Millionaire in more detail. Fastest finger round for lifelines. The very first thing you’ll need to do when playing Who Wants To Be A Millionaire online is to answer the fastest finger question. Whilst you’re attempting to put the answers in the correct order, a timer is running down across the top of the screen. At certain time intervals a lifeline will be lost, so it’s definitely in your interest to answer the question as quickly as possible. If you take too long or put the answers in the wrong order you will lose all of your lifelines. Ask the audience. The "audience" is asked the question and their results are shown in a bar graph. Phone a friend. A "friend" is called in the game and gives his opinion on which answer they believe is correct. This lifeline is hilarious at times. 50/50. Removes two incorrect answers, leaving you with the correct answer and one remaining wrong answer. Main Who Wants To Be A Millionaire quiz round. This is the main (and most fun) part of the Millionaire online quiz game. You have 15 questions to answer. The more questions you answer, the more you can win. After you hit the questions with prizes, you get to choose whether to continue with the game or collect your winnings. You have around 10 seconds to answer each question. So no, you don’t have enough time to Google the answer. If you answer a question incorrectly, you lose. If you pass certain question milestones, you cannot lose more than the amount at your last milestone. The milestones are at questions 5 and 10. If you are stuck on a question, you can use your lifelines. Lifelines can only be used once, but you can use more than one in a single question if they are available to you. That’s about it. You’ve almost definitely seen Who Wants To Be A Millionaire on tele enough times to know how it works anyway. Playing the online game isn’t much different. Who Wants To Be A Millionaire strategy. Be clever. That’s the best strategy. Obviously easier said than done though. Keep your mouse in the middle of the four answers before the fastest finger round starts. This will save a few precious milliseconds. Don’t get cocky. Questions can get very difficult very quickly. If you don’t know the answer and you have no lifelines, you’re going to need to get very lucky indeed. Read the question. Your school teachers weren’t lying to you. Don’t pick the wrong answer because you didn’t take the time to read the question properly. You’ll usually lose "ask the audience". It’s difficult to save the "ask the audience" lifeline in the fastest finger round, so treat it as a bonus if you do get it. You’re better off taking your time and getting 1 or 2 lifelines than rushing and losing all of them.